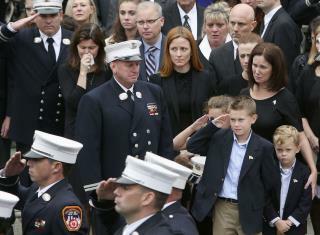 (Newser) – As donations pour in to help the wife of a fallen FDNY battalion chief, she's shocked everyone with an announcement of her own: She'd like to forego the money for herself and give it to a group that helps wounded soldiers, the New York Post reports. Michael Fahy was killed Sept. 27 when a suspected drug lab exploded in the Bronx, and the Tunnel to Towers Foundation—an organization that offers support to injured service members and firefighters—immediately approached Fahy's wife, Fiona, with a generous offer. "We wanted to pay off and help with the mortgage," says COO John Hodge. But Fahy, who had just watched a documentary about the organization with her husband the week before, had other ideas about what to do with the money. I would hope that this heartbroken lady will calm down and find peace about her earlier decision. If she decides not to use the money for her family, it would be far, far better to give the money to fire and policemen than to the voluntary pawns of our degenerate government. Work as a lawyer must pay well, considering as widow with three children she'll be the only breadwinner.